A new interactive tool created at the REACTOR Lab will help to better understand motorcycle crashes in Iowa. 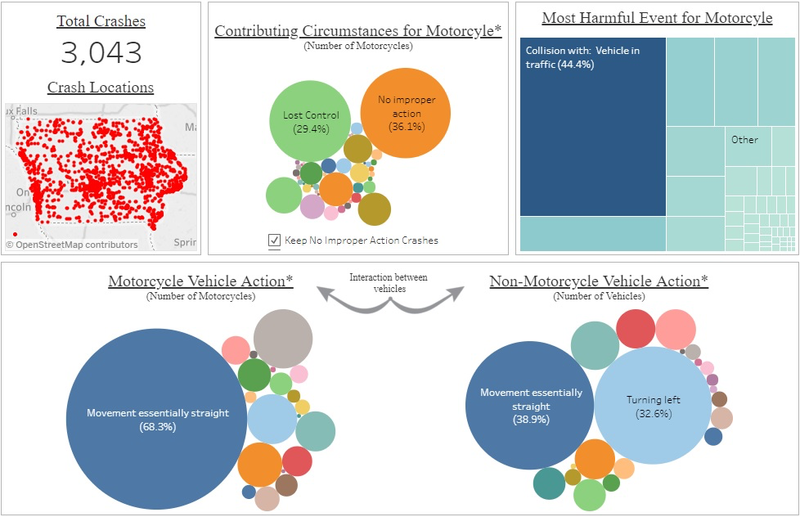 The data collected from 2015 to 2017 on crashes involving motorcycles helps offer insights into why the incidents occur, where they occur, and hopefully, prevent them from happening in the future. The tool was unveiled to coincide with Motorcycle Safety Awareness Month in May. The tool is available at the REACTOR Lab website here. Of the 3,043 motorcycle crashes included in the data, they were nearly evenly split between single motorcycle crashes and crashes involving other vehicles. 15 percent of single motorcycle crashes involve drugs or alcohol, which is higher than the 7 percent of single vehicle, non-motorcycle crashes. Other information can be gleaned from delving into the data. Five tabs made for the tool can give users more details on the times crashes occurred, the actions the motorcyclist and vehicles were undertaking, the driver condition, the condition of the roadway, and more. While motorcycles are the focus of the data, users can also look at other selected classes of unenclosed vehicles such as ATV’s, mopeds, autocycles, and snowmobiles. For more information, contact Skylar Knickerbocker at sknick@iastate.edu or Zach Hans at zhans@iastate.edu.